Dubai, UAE, September 09, 2018: The tourbillon is viewed as the crowning achievement of watchmaking. The engineers and watch- makers of Carl F. Bucherer have implemented this fascinating mechanism in a movement like no other. In the new CFB T3000 manufacture caliber, the tourbillon appears to float, but is actual- ly mounted peripherally. A world first developed exclusively by Carl F. Bucherer, the pioneer of the peripheral automatic winding system. Further highlights are the stop-seconds function of the tourbillon and the fact that the movement is a COSC-certified chronometer. Baselworld 2018. 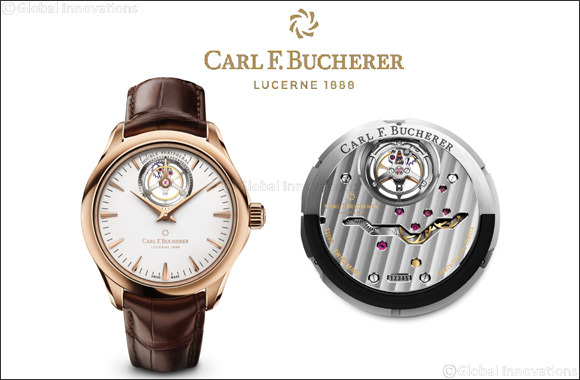 Carl F. Bucherer is one of the few established manufacturers able to develop and manu- facture its own movements. Watches featuring the CFB A1000 and CFB A2000 caliber families, developed and manufactured entirely in-house, contain the innovative peripheral automatic winding system and are mainstays of the collection. After four years of development, the CFB T3000 manufacture caliber now fol- lows, impressing with a tourbillon construction like no other. A key and patented feature of Carl F. Bucherer are manufacture movements that incorporate a bidirectional automatic winding system with a peripheral rotor. This distinctive construction allows for the watch’s flat design, while ensuring eminent reliability and an unhindered view of the superior movement. The benefits of this construction principle inspired the engineers and watchmakers at Carl F. Bucherer to develop a very special kind of tourbillon. Unlike traditional tourbillon features, it is neither mounted in the movement’s main plate nor in an overlying bridge. Instead, the shockproof tourbillon cage, which appears to float inside the watch, is actually sitting securely in position and supported peripherally by three ceramic ball bearings. Distinctively non-visible to observers, these bearings ensure precise guidance and smooth running. The CFB T3000 manufacture caliber, comprising 189 individual parts, stands out because of its exceptional accuracy and first-class precision, making it one of the few currently manufactured tourbillon movements to officially be chronometer certified. This is achieved, in no small part, by its especially precise adjustment system. As is the case with the CFB A2000 manufacture caliber, the watchmakers of Carl F. Bucherer chose to create a completely free-breathing balance spring that remains unchanged in its effective length. The movements are adjusted entirely via eccentric screws or masselottes. These are small screws that are mount- ed externally on the balance wheel and with which the inertia of the balance can be regulated. To ensure the highest level of stability, the balance oscillates at a frequency of 3 hertz or 21,600 beats per hour. The escapement, i.e. the pallet and escape wheel, is made from silicon, reducing friction and allowing the system to operate without lubrication. This increases the power reserve to at least 65 hours and ensures that the movement is not negatively impacted by magnetic fields. A further distinctive feature is the stop-seconds function, which allows for the rotation of the tourbillon cage to be stopped. This means the watch can be synchronized with a standard time and thus set to the second. Such a technical masterpiece deserves to be presented in a place of striking prominence. The engineers of Carl F. Bucherer decided to position the tourbillon at 12 o’clock, where it is visible through an opening in the dial. This window is encircled by a 60-seconds scale and allows the tourbillon to also serve as a small-seconds indication. A second hand is positioned on the tourbillon cage, which rotates around its own axis once every minute. The tourbillon can also be admired through the sapphire-crystal case back, accentuating the view of the exquisitely decorated stripes on the bridge. The new movement celebrates its debut in the Manero Tourbillon DoublePeripheral. Befitting of its quality, the technical masterpiece is housed in a classically elegant 18-karat rose gold Manero case. Rotor patent: Automatic winding mechanism with peripherally suspended rotor ring that is mounted with three ceramic ball bearings on its inner circumference. The three ball bearings are mounted on springs and act as a shock absorber. In contrast to centrally mounted rotors, the peripheral rotor ensures an unhindered view of the movement and allows for the watch’s flat design. Tourbillon patent:* Tourbillon with peripherally mounted rotating carriage. With the tourbillon of Carl F. Bucherer, the mounting of the carriage is ensured by three ceramic ball bearings, which support and guide the bearing wheel at its circumference. These can be adjusted by an eccentric mechanism in order to optimally set the clearance. In comparison to conventional tourbillons, this construction allows for a lower height and an unhindered view of the rotating carriage from both sides.